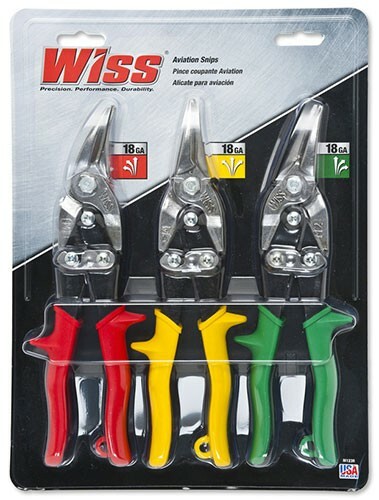 A Tool-Rank user sent in a tip about a price reduction on the Wiss 1-1/2-inch 3-piece Steel Aviation Snips set at Lowe's. The regular price on these was about $35, but they have now been reduced to $19.97, a savings of 43%. For comparison, HomeDepot has this same 3-piece set listed for $31.46. Quantities and availability may vary from location to lactation, but you also have the option to buy from Lowe's online. If your local HomeDepot carries this same set, you also have the option of using their price matching policy to get an additional 10% off. The set includes snips to do straight cuts, left cuts, and right cuts in low carbon cold rolled steel up to 18-gauge thickness. They feature a spring action handle to speed up cutting, and a latch keeps the jaws closed when not in use. 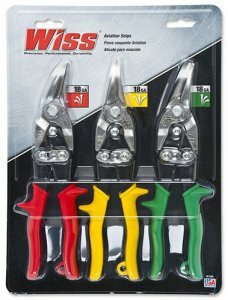 The Wiss snips also happen to be made in the USA. BUY -Lowe's, before they sell out. This could be closeout pricing.